Alarms activate this morning around Gaza, political-security cabinet to meet at noon. Hospital reports improvement in woman's condition. 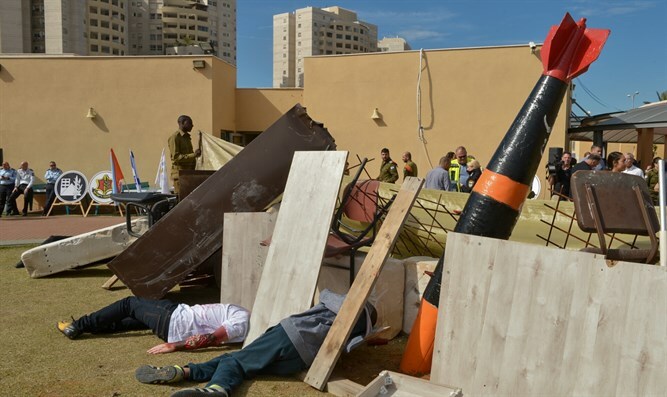 Soroka Hospital reports another improvement in the condition of the woman injured by a rocket that landed last night in a packing house in the Eshkol Regional Council. Her condition is now listed as moderate. She is conscious and breathing on her own. The woman is hospitalized in the hospital's intensive care unit. Alarms were heard this morning across the Gaza area, in Ashkelon, and Netivot. The IDF renewed attacks in Gaza and since morning three emplacements of rocket launchers and mortars were hit. Nine people are still hospitalized. Since the beginning of the escalation, 26 casualties have been evacuated to hospitals last night and this morning. Prime Minister Binyamin Netanyahu will hold a security situation assessment with the Defense Minister and top security force echelons at 12:00 in the Kirya in Tel Aviv. At 16:00 the Political-Security Cabinet will convene. Following a defense establishment situation assessment the Home Front Command issued special instructions to residents. Because of the expanded fire zone, guidelines were extended to Netivot. Guidelines include staying close to protected spaces, and summer camps in places all the way to Netivot have been canceled. Workplaces will operate only where there is a protected space. In addition, agricultural work in unauthorized. Zikim Beach is closed to the public and the railway line between Ashkelon and Sderot has been closed. The IDF says as of now, approximately 180 attacks were identified from Gaza on Israeli territory. The Iron Dome aerial defense system intercepted over 30 launches. The majority of projectiles fell in open areas. In response, the IDF attacked over 150 military targets.